Wisdom of Life. 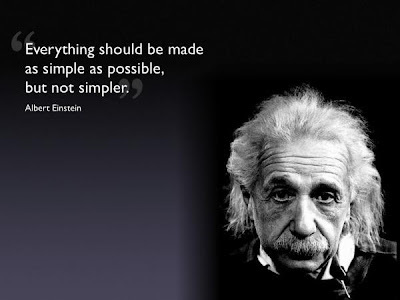 : Simplicity sells. Linn, one of our customer support executive was kind enough to call my mobile phone. She knew i was trying to make a quotation for 10 million life insurance cover, and our system in my office could not cater my need. I had to give all the necessary details to her before she could assist me to get the exact premium and layout from Singapore. What a joke was that!!! Twenty five years ago without computer, all our quotations were calculated manually. We could get to the exact amount immediately with our rate book which we carried all the time. Today everyone is so dependable with the computer, we have forgotten how to compute ourselves. What a shame! That's including myself. Things change so fast and rapid, we hardly have time to cope up and understand all the benefits and plans. I guess most of our agents are merely guessing their work because even the management staffs are also not sure of all the changes happening at this moment of change. I told Linn, selling to strong and wealthy prospects is different from wage earners' buyers. Rich prospects are always busy and they seldom allow us much time to present our proposals. They are intelligence and sharp in mind. In order to sell a bigger plan to them, the plan has to be as simple as possible. If one could present with just one page presentation, they would take you as smart and efficient as well. So sad! Today the smart Alex in the company created all sort of options and fanciful benefits to try and make thing marketable and attractive. Comparing to wage earners' prospects, they have more time to discuss business. They are prepared to sit down with our agents to go in details. However with so much to explain and so many pages from the quotation, i wonder whether they really understand in full. More so if the agents are relatively new in this profession. Linn had time to listen. We spoke for half an hour over the phone without hesitation to share and learn. I told Linn before she put down her call. I could speak long enough with you because you are only an employee of our company, when you know i have the confidence and attraction. If you were the CEO, you might not allow me to speak this very long. Right? Unless i could be precise and straight to the point to benefit this important person. Selling life insurance is to the same. Either you make the plan simple or you try to confuse by being too comprehensive. I still prefer the simple plan. What say you there? To my fellow colleagues in our industry - “Everything should be made as simple as possible, but not simpler.” - Albert Einstein quotes. Life is simple once you understood the golden rules with your wisdom. But many people would like to magnify and complicated the life. Maybe I am from engineering background and with engineering thinking: “Whatever happened must be a reason”. Hence, I always look at things with the pro & con basic simple concept. Definitely wage earners’ thinking is different from the businessmen. Wage earners like to compare and look into detail especially for the insurance plan. All the insurance plans are simple. People make it complicated due to they don’t know how to make the decision. They do not know what they want and how to make the decisions. They want cheap premium with high coverage. Like what the Chinese said:” Want the horse to run fast and don’t want the horse to eat glass”. Once you know what you want in your life, your life will be simple. You had directly translated the right version of that Chinese Proverb of a horse. My version..."How to have a fast running horse when you do not properly fed it with eating grass." Thank you for sharing this meaningful comment.